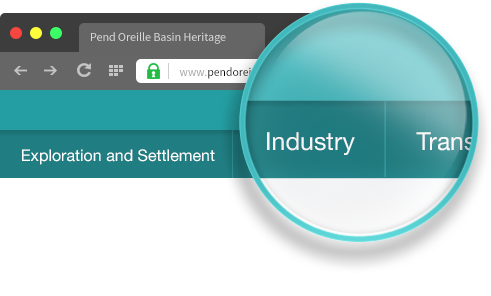 You can get a good overview of the Pend Oreille Basin by clicking on one of the thematic tabs located just above the map on the site’s homepage. 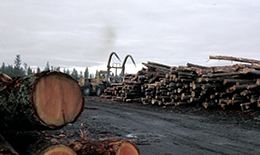 These pages will provide you with background information about each of the topics. Once you have learned a little about the area in general you can dive into exploring the numerous sites located throughout the region. The Home Page map is a great place to start exploring the rich history of the Pend Oreille Basin. Simply click on any of the icons on the map to view details regarding the natural or cultural history sites at that location. First, you can find information on individual sites via the convenient search feature or by filtering all of the sites by category. Second, you can access our unique “Backpacks” feature. Think of “Backpacks” as thematic tours of related sites in the region. There are a number of “Backpacks” to choose from and the most exciting feature is that you can take them with you! 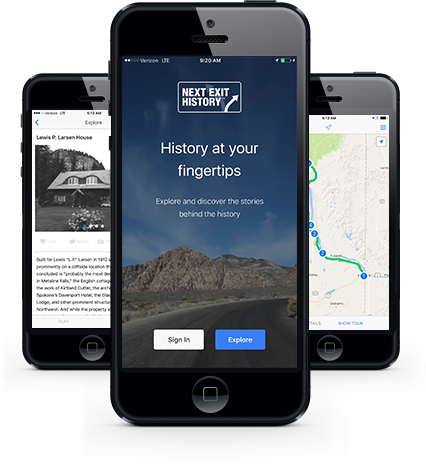 NEH is a powerful suite of mobile and web applications designed to bring history to life for travelers. By utilizing advances in GPS technology and mobile computing NEH provides you with the power to explore the historical landscape around you through your iPhone, iPad, Android phone or Android tablet. Visit the app store for your device, download the FREE app, and access all of the information found on this site while on the go. If you are worried about being able to access the information while touring the basin we have you covered. Once you download the app you can simply save any of the Pend Oreille Basin’s “Backpacks” to your device to ensure that you can access the content even if you do not have a cell phone signal. 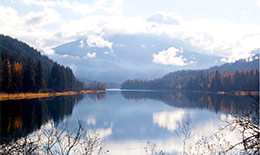 Beyond the Pend Oreille Basin content, NextExitHistory™ contains information on over 55,000 historic sites across the country, so no matter where you go you will always know what interesting sites are waiting for right off the next exit.